What Think Ye of Christmas? This year, I have felt a bit like Mr. Scrooge and The Grinch. Not so much that I don't like Christmas, but I have certainly felt too rushed, too obligated, and too busy to really enjoy it. I'm not really sure what it was about this year, but my goodness, we've been going at the speed of light around here! We did our Christmas baking. Now that we're on our third Christmas here (which is as many Christmases as we've spent anywhere), our list of those on the receiving end has grown exponentially. And Chloe had to bake 7 dozen cookies for her Brownie troop cookie exchange (which meant we got 7 dozen cookies in return...). On Sunday, the whole family worked together to get it all done. Isn't it purdy? We've done Christmas concerts. And concerts and recitals and more concerts and recitals. I think when it was all said and done, we had 8 or 9 concerts and recitals that somebody in the family was participating in. And I don't have pictures of any of them because I was probably being Scrooge-y about it all. I sent out our Christmas cards. It was a process this year, and they went out rather late. The picture-taking, the card-making, the address-tracking, (it felt like over half of my list moved this year) (and most of them to Texas) the husband-bugging (to write the letter that all look forward to), the husband-bugging (it took him a long time this year), the letter-copying, the letter-folding, the envelope-licking-stamping-addressing. A process. I've done my best to stay on top of the shopping and the wrapping and the planning and the cleaning and the running and the erranding and the mailing, and I have officially run myself ragged. Yesterday was the last day of school for my girls, and Sophia and I both woke up with a cough, laryngitis and a bit of a fever. Oh, and cold-sores. But, because Sophia would be devastated to miss it, I let her go to sing her Kindergarten Christmas program and give her gifts to her teachers. And then I went to sing "O Holy Night" for an audience at another school. On sick vocal cords. Because I had promised, and because I was hoping to get rid of my inner Grinch, and singing for people usually does that. Instead, Sophia and I were even sicker when we woke up this morning. And then Joel took us to the doctor. One of the only things that we have been doing this year that reminds me of the reason for the season, is reading a book together every night. We have several good ones, but this year we added a new one to the collection, thanks to its talented illustrator, Jana Parkin. 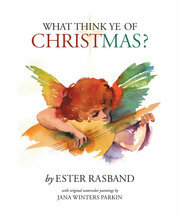 I was blessed enough to win a copy of What Think Ye of Christmas? (as well as several other copies to give away to my friends)(and while I have many more friends than books, I hope those that received one love it as much as I do). Not only are Jana's stunning watercolors beautiful, but the message that the author, Ester Rasband, delivers is beautiful as well. The book is filled with the symbols of Christmas, and reminders of how we can keep it Christ-centered. And how so much of our celebrating is Christ-centered if we look for it. It takes all our time and effort to strive toward being what Christ can someday make of us. Boy did I ever need to ponder on those particular words. It's a lesson I learn most every December, and I always hope I can learn it well enough so that it will stick. So that I can make room for Christ in my overstuffed life for the entire season. I know the busy part will not go away, but I can certainly learn to approach it all differently. And so I will. Because the good news is, that even Mr. Scrooge and Mr. Grinch learned to do it. Surely I can, too. I feel the EXACT.SAME.WAY! usually I adore Christmas, but it seemed to be way too hard this year. I blame it on Dustin being out of town for 2 weeks and then stinking Tithing Settlement so I felt very alone in all the "joy" of the season. But I love your reminder, Thank you!! Thanks for this review. You hit upon the very paragraph that first grabbed me from the original manuscript. I especially love that line: Joy is hard bought. Have a Merry Christmas, Lara! Some years can feel so busy! I hope you find your Christmas Angel before Sunday!! (I think you have a couple in your house (wink).